We’re Mobile Craftsmen. We build mobile apps for iPhones, iPads, Android powered SmartPhones and Tablets, as well as Google Glass. Why mobile apps? They are the best way to connect with the mobile consumer. In February 2014, Nielsen Media reported that SmartPhone users spend 86% of their time using Apps vs 14% using the mobile web. We see this all the time – people are constantly checking their mobile devices for information. It doesn’t matter what that information may be. Instead, it essential to understand that mobile is becoming the preferred method to access and consume media and information. Doesn’t it make sense to engage with your target on their terms? The Mobile Apps Company can help you to do just that. 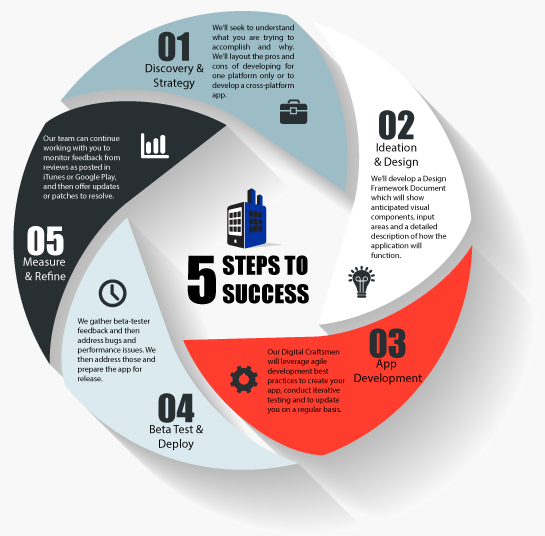 At the Mobile Apps Company, we adhere to a five step-process to ensure that your application matches your vision and your organizational needs. The first step can be the hardest – you know that you want a mobile app, but the broader question should be this: How can I best connect with my mobile-enabled target audience? We’ll work with you to best answer that question by collaborating with you and your team. We’ll seek to understand what you are trying to accomplish and why. We’ll layout the pros and cons of developing for one platform only or to develop a cross-platform app. We’ll then develop some broad concepts and work outlines to ensure a successful mobile app development process. Of course you’re going to want an app that looks great, but mobile design is much more than just the aesthetics. How your app will actually work and function is a key to its success. Things like swipe areas and button sizes enter into the equation, as does the responsiveness of the app to the user’s input. All must be aligned and in sync to give your users an intuitive and immersive experience. Mobile App Company will be working closely with your technical and operations representatives to ensure that the mobile app can communicate and share data as needed with your organization’s systems. Meanwhile, our graphic designers will collaborate with your marketing and branding resources to ensure that the look of the app meshes with your brand and design goals. The deliverable will be a Design Framework Document which will show anticipated visual components, input areas and a detailed description of how the application will function across targeted devices. Working from the Design Framework Document, Mobile Apps Company’s Digital Craftsmen will leverage agile development best practices to create your app, conduct iterative testing and to update you on a regular basis. As we complete the initial build of your application, Mobile App Company will provide access to a cross section of users to test builds of the app. We gather feedback, and then address bugs, usability concerns and performance issues. We then create a more refined version of the app and repeat the process until we reach a satisfactory result outlined in the Design Framework Document. When the app is ready to be deployed, our team will work with you to complete the processed required in order to get your app approved by Google and/or Apple. Then we finalize the required pieces needed so that it can be made available in Google Play or the iTunes Store. If desired, the Mobile Apps Company team can continue working with you to monitor feedback from users as shown in app reviews as posted in iTunes or Google Play, as well as across social media. We can also measure how the app is being used via analytic tools. Then, as warranted and desired, we can provide updates, patches and revisions to the app to keep users engaged and to increase adoption rates and usage. Ready to get started? Then Let’s Get Moving. Complete this form and we’ll be in touch directly.